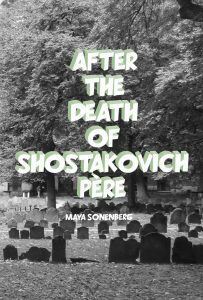 Maya Sonenberg’s After the Death of Shostakovich Père is a fascinating journey of literary nonfiction that carries the reader from Stalinist Russia, through small town rural America, to Escher — jumping from different worlds and back again until they come together in a haunting and beautiful way. Despite its short length, this is a book best read slowly, giving the reader the time to fully understand and appreciate the text’s many surprises and subtleties. One of these subtleties is the book’s brilliant title, After the Death of Shostakovich Père. It immediately tells readers what the book is about, and yet brings with it several questions: for starters, why Shostakovich — not a household name — and who ever wondered about his father? Which Shostakovich are we talking about, and what happened after the aforementioned death? While reading, it becomes apparent that the title refers to Dmitri Shostakovich, the acclaimed composer who wrote music, some of which was inspired by his time fighting in World War II. The title, however, is a bit misleading, as the book is not solely about Shostakovich. Instead, Sonenberg connects the musician to the death of her father and his influence on her, especially his creative influence. A completely satisfying read, the whole book is an elegy for the death of Sonenberg’s père — a successful artist and art teacher, both blessed and cursed with too many talents, passions and demons, and probably too much charisma. We get a sense of the man’s exuberance, as well as Sonenberg’s attempt as an adult to assemble her grief into a coherent mosaic. Sonenberg betrays no hint of rancor, just the good will of intelligent love trying to come to terms with another death. The book explores this death in an episodic format, eschewing linear storytelling and traditional chronology. Instead, each of the four chapter-like sections of the book has its own stand-alone structure and internal coherence. The first section, “Prelude,” introduces Jack and Maya Sonenberg with a photograph of a man sitting cross-legged on the ground, the mountains of Colorado behind him, and a little girl, about six years old, nestled in his lap. The paragraph following the photo is filled with names and places: Aspen, Maine, Hotel Jerome, Kneisel Hall, Mahler, Beethoven, Secretary of Defense McNamara. We are seemingly in media res. Almost immediately, though, the text cuts to a description of the opening of Shostakovich’s Suite for Two Pianos, Opus 6, written in 1922 by the 15-year-old Dimitri Shostakovich on his father’s death. Dimitri and his sister frequently performed this piece commemorating their father, and Sonenberg, directly addressing the reader, wishes we could hear the music that Shostakovich père’s death inspired. The following section, “Danse Fantastique,” is really composed of three parts. The first is a series of brief paragraphs describing some of Maya’s memories of her father, combined with selections from his notebooks. The second part threads in a discussion of Borges’s story “The Garden of Forking Paths,” while the last part returns to selections from Sonenberg’s père’s notebooks, selections that become increasingly fragmented and trail off into nothingness. “Nocturne” is the third section. This is really an extended narrative telling of a visitation between a daughter and dead father. It could be called a dream or a ghost story, but as is with the best of such encounters, this one ends with the living and the dead each returning to their proper place. The characters in this section have names we have not encountered before, perhaps masking Jack and Maya’s true identities here so as to protect their innocence. “Finale” is the fourth and last section of the book. Narrated by Maya, it begins with several paragraphs that start “My father wrote,” bringing Jack’s own words in. Soon, the two voices become indistinguishable as the reader learns of the father’s illness and increasing incapacitation. A discussion of loss follows, in which the author brings together many of the separate elements that appeared earlier in the book: music, ever so important to the father-daughter duo; the significance of Borges to Maya; and, finally, Jack’s mercurial personality. The text closes with more of Jack’s writing, ending with his farewell to his dying mother and bringing each of the book’s themes full circle to truly satisfy the reader. One of the amazing accomplishments of this book is how the four distinct parts hold together. But there is a structure below the text’s surface that is quite extraordinary: Sonenberg’s writing parallels the framework of Shostakovich’s Suite for Two Pianos. The titles of the sections of the book (“Prelude,” “Danse Fantastique,” “Nocturne,” and “Finale”) are those of the Suite. While this realization is on the simpler side, what is not so obvious is that the content of each section of both Sonenberg’s text and Shostakovich’s Suite parallel each other. It is “Prelude” that holds the key, in which Maya Sonenberg writes, “I wish you could hear the bells.” She then proceeds to describe the effect of the four hands on the two pianos, layering sounds on top of each other to capture the reverberant textures of a bell choir, which recurs throughout Shostakovich’s Suite. Meanwhile, Shostakovich’s “Danse Fantastique” becomes increasingly frenetic, just as Sonenberg’s text — through the broken, scattered writing of her father — has a similar effect. “Nocturne” is the perfect occasion for the Sonenberg’s intricately crafted ghost story of a dream, with its bittersweet wistfulness. And the Suite’s “Finale” is just that — all the musical themes, ideas, and motifs return to provide a sense of completion and closure. Sonenburg’s “Finale” does exactly the same thing. Scattered throughout the book are black and white photographs of Jack and Maya, père and daughter, as well as some of his more conceptual art. The photographs merge life and art to make them indistinguishable, just as Sonenberg connecting her own story of mourning with Shostakovich’s, weaving life and art together. Listening to Shostakovich’s Suite while reading can enhance the experience, conveying the inspirations for each, the death of Shostakovich père and that of Sonenberg père. Leonard Temme studied writing most extensively with Marie Ponsot, Sue Walker, Walter Spara, Josh Davis, and Kristina Darling. Following extensive formal training in music composition, he earned a master’s in mathematics and a doctorate in neuropsychology. His day job is as a research scientist in a government laboratory. In addition to his professional publications, his writing has appeared in a variety of literary and small presses.